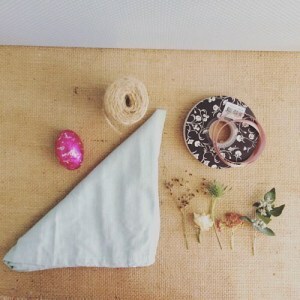 Home / Blog / Easter / Fun with Easter Bunny Inspired Table Decorations! Easter is coming and I hope to invite some friends around for dinner. As you may have guessed (if you have read any of our other blogs) we love to make things pretty and this lead me to consider how to make the table a little fancy without going crazy about it. 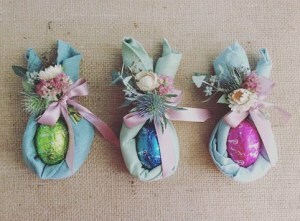 So I did a bit of Google searching and found some pretty amazing Easter related table napkin folding ideas! Many of them looked too time consuming for me but I found one way that looked quite simple and I have decided to do my own version of it, with of course some flowers! I would like to share it with you in this blog in the hopes that you can use it for your table. Perhaps this is even an activity you could do with your kids so that they can make their own decorations! 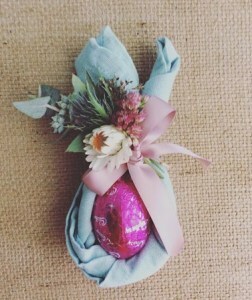 First you will need to roll your napkin so that you may wrap it neatly around the Easter Egg. I found that I had to make my napkin into a rectangle so that it was long enough to make the “Bunny Ears” at the top of my egg. You may need to experiment a little to find the right size for your eggs. I rolled the rectangle napkin on a slight diagonal to give the bunny ears the best shape I could. 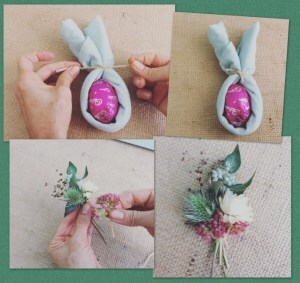 Tie your napkin around the Easter Egg with the “ears” at the smallest end of the egg. 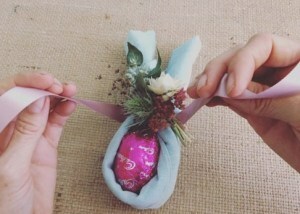 Secure the napkin with some twine to hold the egg in place. Create a tiny posy of your flowers and foliage and secure it together with some twine. If you have a garden you can always cut a selection of foliage and flowers to use. If you don’t access to a garden then your local florist can help you out. Just make sure you let them know what you need the flowers for so that they may help you select varieties that will last reasonably out of water. Small succulents would look great too! Attach the posy of flowers to the front of the napkin to hide the twine tie with some ribbon of your choice. Tie the bow slightly to the side and cut the tails to an appropriate length. Make any slight positioning adjustments you need to make everything sit well and your first Easter Bunny inspired table favour is complete! 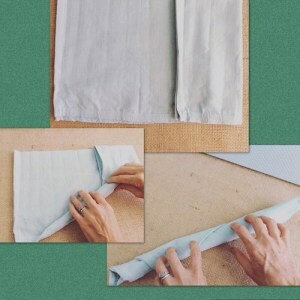 Make enough for each place setting and position them on the plates for each guest to enjoy. If you keep to a limited colour palette it makes it easier to bring your table to a cohesive whole but as always we say – go with what you have! The fun is in the creating and sharing what you have created. 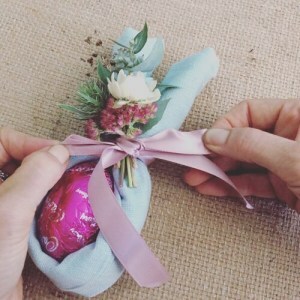 These Easter Table Favours are quick and easy to make and if you have children I am sure that they will enjoy helping to create these with a little help from an adult or elder sibling. I would suggest that once you have all the necessary items it shouldn’t take more than 5-10 mins to make each one. Of course it may take the kiddies quite a bit longer depending of their age. So leave them plenty of time to keep it a fun activity with no stress. We hope that you enjoy making these. 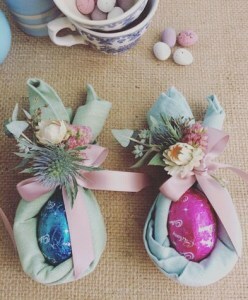 We thought they were such a cute and easy way to dress your Easter Table. Keeping things on the classy side of kitsch! Checkout Western Australia’s Easter Dates for 2019 here and start planning today. If you have family or friends that you would like to send an Easter gift to please take a moment to browse the gift options on our website. 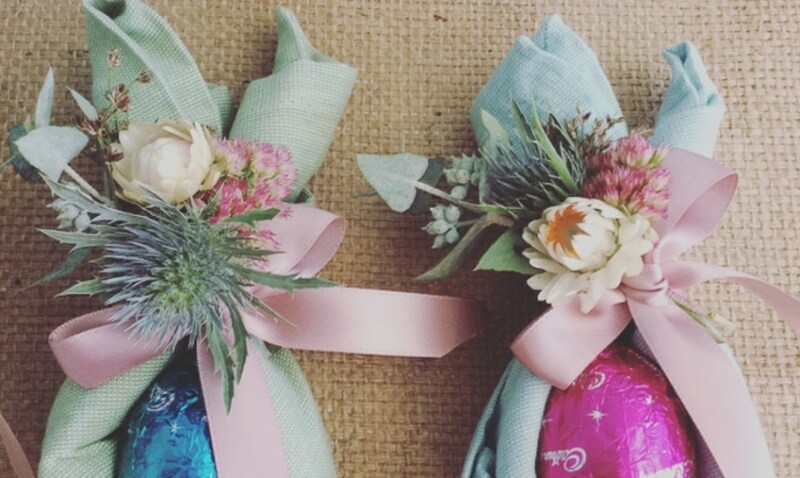 We know how busy life can get so if you would like us to make some of these Easter table favours for your dinner then please give us a call on 9256 2415 so that we can discuss colours and prices with you. We’d love to help you out.